I was really delighted to be at William Booth Primary School in Nottingham again today for another meeting of their Interim Executive Board! Especially as it was the first IEB meeting since the school came out of Special Measures! This was a fantastic achievement for the whole team who under Gary Fullwood's leadership have worked so incredibly hard to change almost every aspect of their practice and provision over the last year and to release the magic in some wonderful young people. 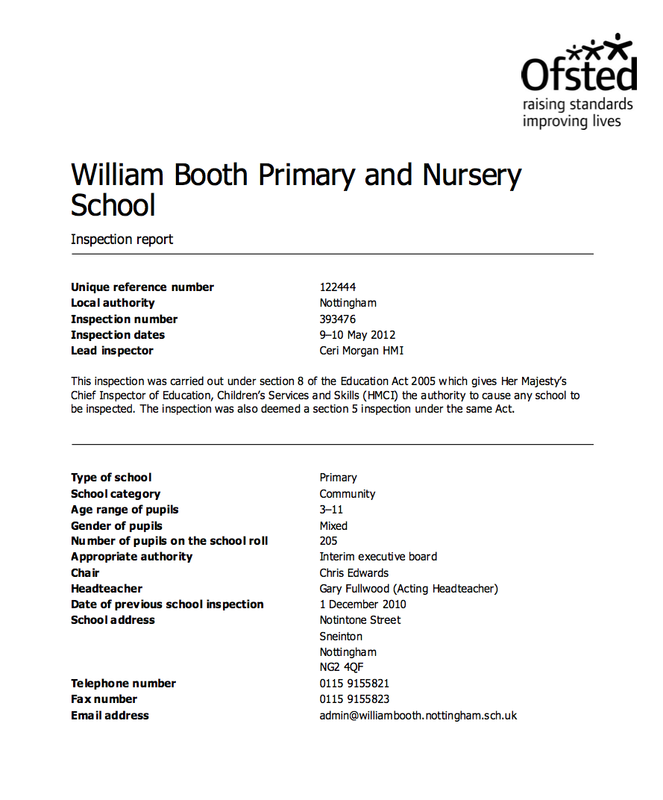 The senior team, Gary, Claire Wilkinson, Tammy Swift and Claire Goodfellow, have done something quite extraordinary because William Booth Primary School had been in Special Measures following a very critical OFSTED Inspection since December 2010. The school has also been going through the transition from being a two form entry infant and nursery school to become a one form entry primary school. 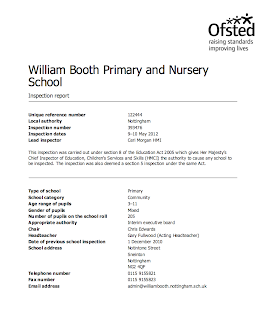 So when I was appointed chair of the IEB at William Booth Primary School in May 2011 some real challenges were facing the school. How could we build on the work in the early years to great a great little primary school? How could we develop literacy policy and practice to ensure that every child is a listener, communicator, reader and writer? How could we develop numeracy policy and practice to ensure that every child is a counter, can calculate and is confident with numbers? Critically we also needed to focus on discipline, behaviour and building character to prepare young people for secondary education and life! 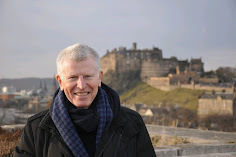 I was incredibly fortunate to be supported on the IEB by three experienced chairs of governors; David Harris, Lesley Odell and Sue Thornton and two parents; Liz Roberts and Hayley Howard. We were also very lucky to be monitored and supported by Ceri Morgan HMI whose experience, insight and analysis helped the school on its journey from inadequate to satisfactory with many good features. This was a school where a young enthusiastic and committed team wanted to do a great job and Gary Fullwood and the senior team have now built a strong performance management and coaching culture where everyone has access to training and personal development. They also worked with some great colleagues in the authority to improve and continuously develop their practice drawing on assessment for learning and the intelligent use of data to ensure that every child is provided with the curriculum and the opportunities to reach their potential... a brilliant story and a great team effort!